by concentric cracks. Credit: NASA/JPL/University of Arizona. Areas of Mars larger than Texas are wrenched and twisted, with deep canyons and sharp fissures, yet they are scoured clean of rocks and dust. 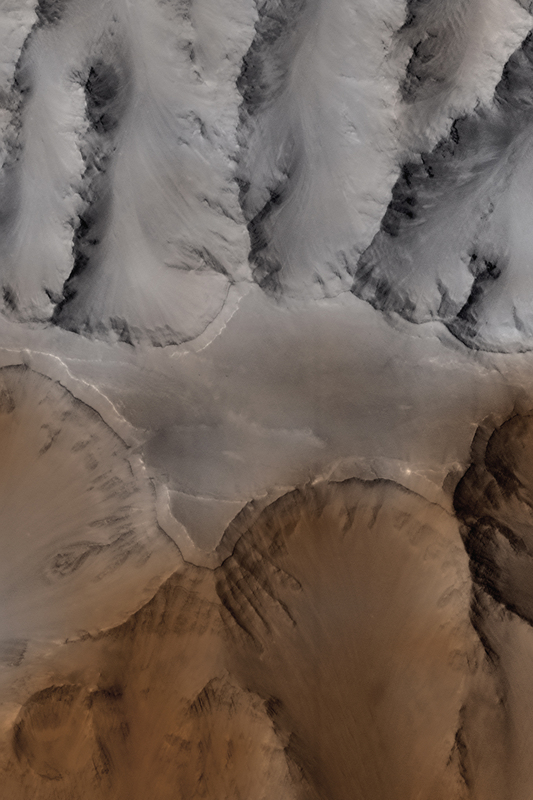 In previous Thunderbolts Picture of the Day articles about the geology of Mars, powerful electric arcs were theorized to have once impacted the surface, creating many of the features observed by orbiting cameras. Sinuous rilles, flat-floored craters, "railroad track" patterns in canyons, intersecting gullies with no debris inside them, giant mesas, and steep-sided ravines are all evidence for the activity of electricity on a massive scale. The Mars Global Surveyor (MGS) carrying the Mars Orbiter Camera (MOC) entered orbit around the Red Planet in 1997. 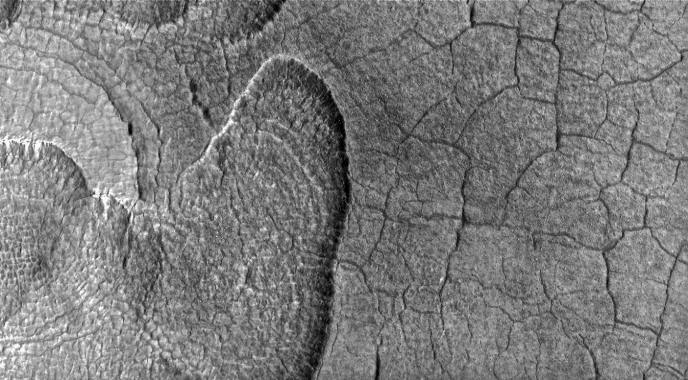 Among its first discoveries were outcrops of layered rock extending for hundreds of kilometers through the Schiaparelli Basin. The same formations were seen running up the walls of Valles Marineris. Imaging analysts from NASA’s Johnson Space Center announced the discovery of mounds on Mars that they have suggested might be the remains of hydrothermal vents. They have a similar appearance to some structures found in the Australian Outback, so researchers think they could have similar origins. Both the layering of the rock strata and the shape of the mounds are seen by planetary scientists as having been caused by erosion in the same way that geography on Earth is eroded. Since Earth is seen today to be eroded by wind and water, they surmise that such processes occurred on Mars. Modern science has retained the long-hoped-for desire that Mars could be the cradle of different life forms that arose and evolved in a separate ecology. As the overall theory states, the planet must have gone through a stage when there were oceans of liquid water on the surface. This implies that Mars once might have retained an atmosphere dense enough in oxygen for life to respire in the open. Allan Treiman, a geologist from Houston's Lunar and Planetary Institute wrote: "The idea of it being liquid water was a very reasonable hypothesis to start with. From my standpoint liquid water hasn't been proved at all." The large-scale structure of Mars with its continent-wide canyon, gigantic volcanoes, thousand-kilometer-wide craters, fractures, plateaus and blasted wastelands of crushed stone was most likely created a short time ago. Vast clouds of plasma and their associated lightning discharges probably contributed the energy necessary for the terrain to be sculpted so quickly. As electric current passes through a solid body it can erode material from it, or deposit material on its surface where an arc makes contact. The pits or craters left by electric arcs are usually elongated circles because the arcs strike at right angles to the surface while they move. Material in the bottom of a crater will probably be electrically heated, burned, and melted. 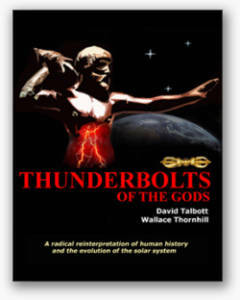 If the surface is positively charged, an arc will tend to stick in one place, resulting in increased melting, while the electrical forces lift the surface to form a “lightning blister,” or fulgamite. Fulgamites appear as “domes” on Venus and as pedestal craters on Mars. An even larger scale example is Olympus Mons. If the surface is negatively charged, electric arcs will tend to move rapidly across the surface after striking and carving out a crater. 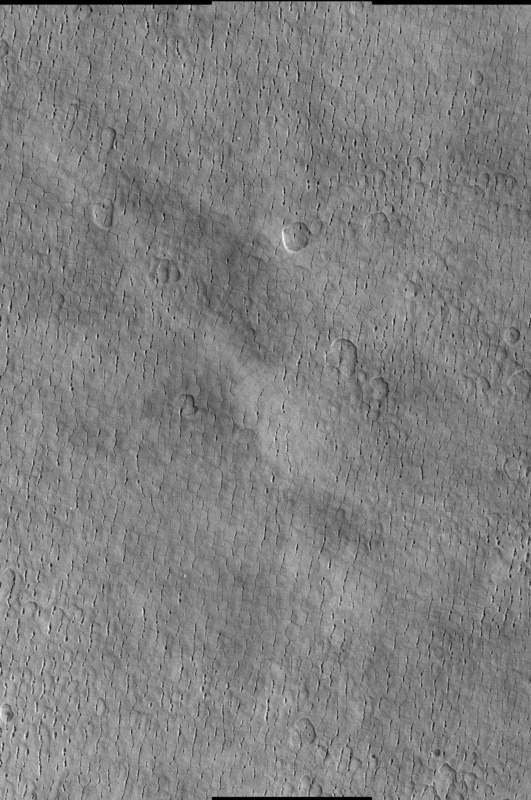 Small craters on the rims of larger ones are signs of this effect. 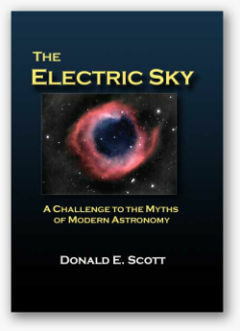 Sometimes, as electric arcs travel, they will cut chains of craters. If the craters overlap, the result will be a steep-sided trench with scalloped edges. When electric currents pass through a plasma they are twisted into a helical pattern as the forces attempt to balance themselves within the magnetic turbulence that is created by the interaction. Mars has a weak magnetosphere, .00125 that of Earth, and it is almost directly exposed to intense positive charges coming from the Sun. 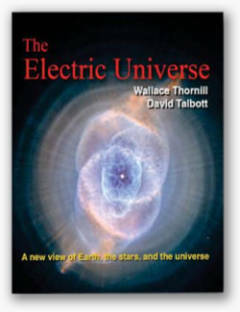 As the Electric Universe theory argues, at some point in the past the intensity of those forces increased and traveled through the planet from pole-to-pole in a powerful electric circuit. That formidable event excavated billions of tons of material from the north polar region, while at the same time layering a similar volume of material on the south pole. During the discharges, Birkeland currents cut deep canyons at the north and south poles, while simultaneously drawing surface debris into curvilinear ridges that run parallel to them. The result was the “fossils” at both poles of a planetary electric vortex that engulfed Mars, as well as the thousands of slot canyons and scalloped pits covering Utopia Planitia.